Continuing further with that on-going series of blog posts on My Top 5 iPad Apps of the Week, here I am, once again, sharing with you folks another round of interesting and worth while checking out iPad Apps I have bumped into over the last few weeks and which I have been enjoying quite a bit. This time around we are going for Week #4 where I have got something for news junkies, road warriors, weather addicts and, of course, the game of the week! So, let’s do it! Oh, hang on, before we get things going with them, and like I have mentioned on a previous blog post over here as well, I thought I would share a couple of interesting links related to the iPad and how it is changing the way not only we participate on the Web as end-users, i.e. as Web 2.0 enthusiasts, amongst several other activities, but also from a business perspective. Specially, today, where I have got a couple of superb links to share with you folks that clearly establish the path to follow on improving the overall user experience into new heights for mobile business workers. Well, that may no longer be the case. Read further on for his conclusion, which I think is very much worth while reading. I think the race has just gotten started. I think that more and more businesses are beginning to turn into devices such as the iPad to help improve overall the performance from their knowledge workers, specially those who are mobile. SAP has already started with that race, but I think that’s just the beginning. Have a look though into what Hyatt Hotels & Resorts are doing though. Specially, check out the nearly three minute long video clip that explains thoroughly what that innovation within the Enterprise could look like! And be ready to be WOWed big time! Indeed, I can relate, very much, to what John ﻿Prusnick mentions on that article, since I have been using Lotus Traveler myself for work and it’s just beautiful! Not that I care too much about email, since I hardly use it anymore, but having quick access to my work calendar & agenda, as well as contacts, while I’m on the road, in a secured manner, is a killer! And, if, on top of that, you have got VPN access to your company’s Intranet network, like I do, then it all becomes a treat, to say the least! Boy, I just can’t wait for my next business trip and see whether I can make it and survive it without having to carry anything else than the iPad. Can you believe that? 2 months ago I didn’t think it would be possible to travel without my Mac. Very soon, on my next business trip, it’ll be a reality! 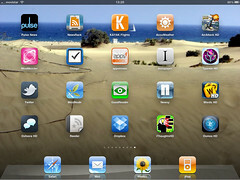 Yes, the iPad for the Enterprise is here! And, sooner or latter, it will catch up with everyone! So you better start looking forward to travel light, to much less pain on your shoulders and back, to the complete mess with cabling and gadgets to carry with you, and so on and so forth. Never mind where things will be going as we all become more and more mobile by the day! Indeed, I can’t wait! Pulse News Reader: For those news junkies out there (Yes, I know! You can never get enough of them, can you? Welcome to my club! hehe), here is the first news related app I installed on the iPad on the same week when I bought it and I still use it on a daily basis. It allows you to customise the resources you would want to tap into and both the horizontal and vertical scrolling experiences are amazing. Incredibly engaging! Worth a look, for sure! NewsRack: Ok, in the past I have mentioned how Reeder for iPad was my preferred RSS feed reader client for the iPad. Well, since we all know how RSS Feeds are not dead just yet, right?, I have got a second one: NewsRack. It was actually my first iPhone app for feed reading and I was surely really glad when it came over to the iPad as well. I access my second Google Reader account through it on a regular basis and the reading experience is quite something! Even for large amounts of feeds! Loving it! Kayak Explore + Flight Search: This one is for those road warriors or those folks up in the air living their lives more on a plane than on the ground itself. Kayak would allow you to just find plenty of really good options for your upcoming trips and find that weird combination you can get anywhere else! I have tried it out a few times and it’s gotten me out of trouble far too many times! And browsing it through the iPad vs. the iPhone *does* make a difference! AirAttack HD: And, finally, like usual, to close off the Top Picks of the week, here is the iPad Game of the Week: AirAttack HD. When I was a lot younger I used to be hooked into these kind of video games where I could play them for hours without getting tired of them. Remember the original Battlefield 1942? Well, this one is just as good, if not better! The graphics are amazing and the overall gaming experience is amazingly engaging and all of that for 0.99$; so who can’t ignore that? It’s just unbeatable, don’t you think? My favorite RSS reader is “River of News”. It´s the only app marking the news items as read as you scroll down, just as it does in Google Reader. And of course it syncs with Google Reader. I see the AccuWeather app is free but what are we looking at cost-wise for these multiple apps? Sorry, just asking because I am completely unfamiliar with this. Luis what would be interesting is to tell us which apps you “stop” using after you have included them in your weekly Top 5. Love these lists, Luis. Keep ’em comin’! From the very first beginning I started using Pulse, is an awesome app for reading news. Without reason Apple put it out of the Appstore but brought it back a few days later. The game of the week… is really good it reminds me to some Snes games my cousin used to have. I’m surprised that there isn’t a mind mapping app in the list this week 🙂 Enjoyable read as usual, thanks!